The old saw goes that “A chain is only as strong as its weakest link.” The same goes for construction. In this time of “Jetson speed” change in the technology of our industry and the structure and finishes of our buildings, sometimes on the jobsite the most basic element can make or break our schedule and the quality of the finished product. 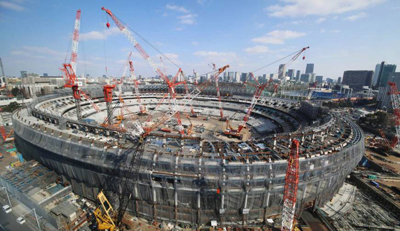 In one case, the 2020 Olympics called Tokyo 2020 billed as “the most high-tech Olympic games in history,” according to a recent article in The Telegraph, “which will include more than 11,000 athletes competing in a record 339 events across 33 sports. For the first time, the Games will include karate, skateboarding, sport climbing and surfing.” a very simple component in the construction has slowed construction of some of the high tech elements of this massive effort of housing, stadiums, hotels and infrastructure. According to The Telegraph article, 253 of the 305 construction companies working on the projects involved in this massive effort have reported delays caused by a shortage of bolts, yes bolts. The Infrastructure Ministry pressed for more production from the manufacturers and suppliers but were told that they were already working at capacity. Not good news for projects like the new National stadium working towards completion for the opening ceremonies on July 24 of this year. The Olympic venues are not the only ones that are suffering. The Egao Kenko Stadium in Kumamoto scheduled to host the Rugby world Cup matches this fall has fallen behind due to a shortage of bolts. All this to say that the timeline for the most sophisticated of newly engineered projects can be slowed or even stopped by the simplest of components like bolts if the construction companies and specialty contractors boldly assume that the parts will be there when they are needed. This can be especially critical when a project stalls at 70 or 80% complete and the specialty subcontractors are trying to get onto the job to do their work. Hopefully you have not forgotten to check your suppliers for the equipment and materials for your work. Consider this a heads up for one of those unintended elements that can upset your plans for “on time” completion.